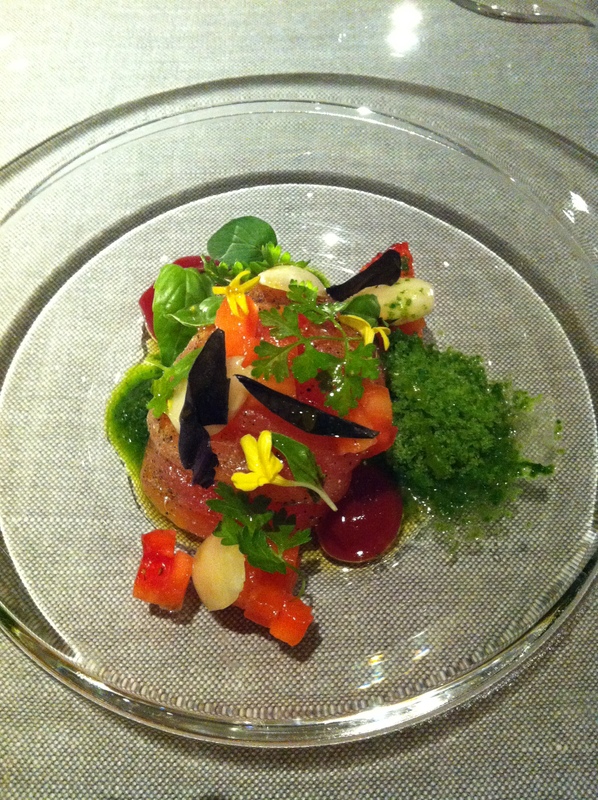 For 84 Euros per menu degustacion, I expect my socks to be knocked off, not just by one or two plates, but by all 8. Unfortunately, this wasn’t the case at Sauc restaurant last night. 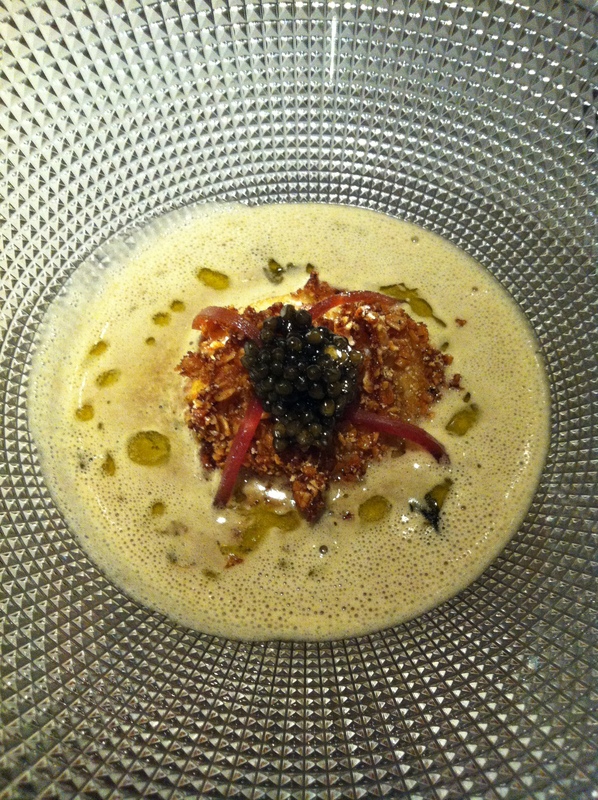 My favorite dish was the poached egg, topped with cereal and caviar all set in a cappuccino broth. It may sound a little strange but it looked awesome and it tasted even more awesome than it looked. The picture is at top. I loved, loved, loved it! My other favorite dish of the night was the Mediterranean crudo red shrimp topped with a thin film of clear, warm bacon fat. What’s not to love about fresh shrimp and warm bacon fat, both of which literally melted in my mouth upon contact? It was indeed delicious. Wish I would have snapped a picture of that one. Other than that, the meal was very unmemorable and I was hugely disappointed. Borja, my dining partner and sous chef at Dos Palillos, agreed. Borja turned 26 yesterday and his dad forgot his birthday, so I decided to take him out for a great meal, or what I thought was going to be a great meal. This kid, although very young, has worked under Alain Ducasse, in 3 Michelin star restaurants, and under some of the best chefs in the world. Ferran Adria loved Borja’s bone marrow and caviar dish and said it was one of his new favorites. Obviously, Borja has talent and a palette to match. So, I researched a bunch of 1 Michelin starred restaurants within walking distance from my place, hoping two foodies would have an excellent meal. My first 2 choices had no openings. So, we went with my third choice. I’m always leary of eating at a hotel restaurant, but there are a bunch of 1 Michelin starred restaurants in Barcelona that are indeed in hotels. So, I have to get over it. Having said that, I can’t remember one thing I loved about the Sauc dining room. It was stark-modern and felt kind of cold (not temperature-wise). Yes, the actual plates they served the food on were nice, and some of the presentations were lovely, like this tomato salad below, but worthy of a Michelin star? In my opinion, no way. First, don’t skin an underripe tomato and make it the star of my dish. If you can’t find good tomatoes or your supplier is an idiot because there are amazing tomatoes out there right now, don’t serve a tomato salad. Well, actually, that’s not first. First is don’t give me some greasy potato chips and an olive cake as a palette opener that is super sweet and tastes nothing like olives. Because it was light grey, I’m guessing the olive cake did have black olive juice in it, but the sweetness overpowered any olive taste that was suppose to be there. Unappetizing. I love lamb, so whenever someone serves me lamb I’m expecting it to be delicious. The cabrito (baby lamb) was so fatty and so salty, that both Borja and I took 2 bites each and then told them to they could take the dishes away. As the main meat course, that’s not acceptable. I was hoping they would redeem themselves by employing a rock star pastry chef, as I do love my sweets. The first dessert was a cherry cake with cherry foam. It was good. But, that’s all it was. 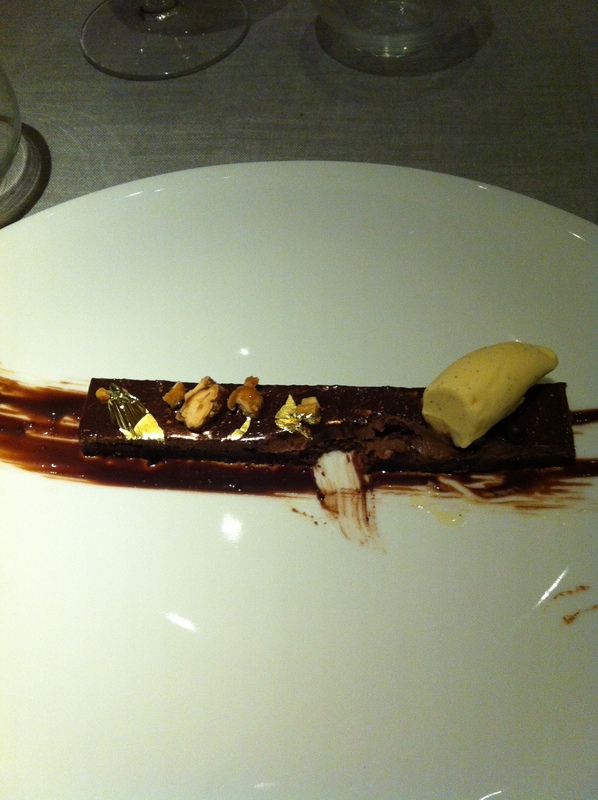 Then, the last dish of the evening continued to disappoint – hugely! Disclaimer: I love chocolate and have tasted a fair share in my life, so that means I’m a tough critic when you serve me an all-chocolate dessert. That said, if you’re going to serve me a dark chocolate log with a few walnuts and a not so vanilla-y vanilla bite of ice cream, your log better be phenomenal. It was forgettable as far chocolate goes. Hmmmfff! The more chefs I dine with and work for, the less sure I am of what exactly I would want my restaurant to be like. There are endless possibilities! But, the more chefs I dine with and work for, the more I understand what my philosophies of running a kitchen and a restaurant need to be in order to keep staff happy and loyal, and to turn out great food in which both the kitchen and the clients are smiling at the end of the day. Nothing worse than an unripe tomato. They obviously did not know who they were dealing with, especially when it comes to chocolate! It is tough to beat Grandma Nolan’s chocolate cake! You were a little spoiled in the choc dept. growing up! The rest has to stand up to your “world travels” and diversified upbringing. Not many kids eat or even know what raw kibbi is. You did start young being a food critic.